Nu is er ook een Trek Soho met bagagedrager en schijfrem vóór in combinatie met een rubberen bumper op de bovenbuis. 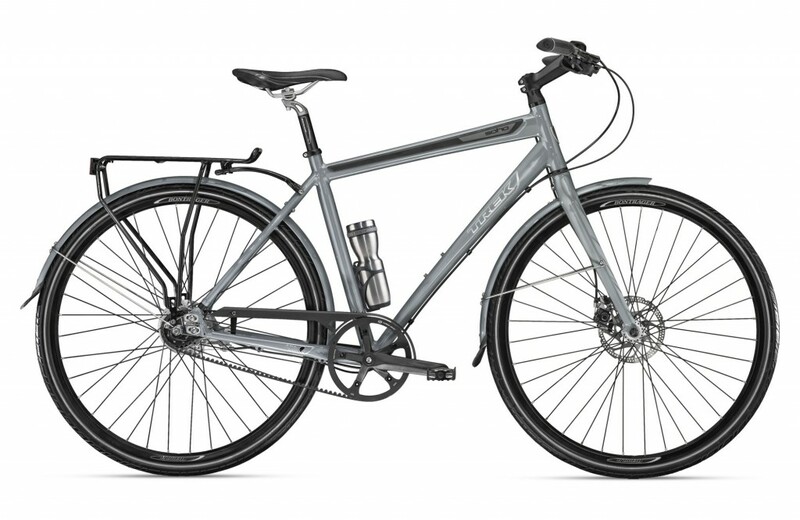 Die rubberen bumper had de Trek Soho ook al, maar die schijfrem voor niet, maar een rollerbrake. Bekijk ook de Cube LTD 2012 of deze video over biking in Moab Utah. Why don’t you list the weights of your bikes? Can you tell me the weight of a particular model? Due to manufacturing tolerances in all the parts that make up a bicycle there will always be some variation in the final weight of the complete bike even when the model and size remain the same. As a result, any weight we list would be a rough approximation of the weight of the bike you are looking at. Most of our models come in multiple sizes which add to the variation in the measured weights within a given model. It is simply not feasible to weigh a wide sample of bikes in all the different sizes offered only to provide numbers that will still lack the accuracy which we know our customers expect. We understand how important weight can be in making your purchasing decision and for that reason we suggest going to your local dealer and weighing the actual bike you are looking at in its fully assembled state. This way you can be assured that the weight you are getting is accurate for the exact bike you have selected. Heb je enig idee hoe zwaar de Soho DLX is?